Woodley is a suburb in the Metropolitan Borough of Stockport, Greater Manchester, England, on the east side of the Peak Forest Canal, next to Bredbury and Romiley and the boundary with Gee Cross, Tameside. Historically part of Cheshire, the name means "a clearing in the wood", so named because the area contains a lot of woodland. The Peak Forest Canal through Woodley features a long tunnel. Woodley railway station is on a loop which stretches from Ashburys to Romiley via Guide Bridge avoiding Bredbury. Woodley Primary School, previously called Woodley Infant and Junior schools. The school also ran a nursery which was next to (and connected to) Woodley Methodist Church. Greave School, in Greave, on the border with Romiley. Primary school aged children can also attend a nearby school in neighbouring Bredbury: St. Marks C. of E. Primary School on Redhouse Lane; this was the original infant and junior school for the locality. After education in these primary schools, most students feed to either Werneth School, Marple Hall School or Harrytown Catholic High School for their secondary education. Woodley is home to four pubs, The White Hart, The Railway, The Navigation and The Woodley Arms. These pubs form the start of the Ring of Death, a pub crawl that takes in Woodley, Bredbury, Romiley and ends in Greave. The Ring of Death used to consist of twenty pubs in total and was a traditional marathon undertaken by locals at Christmas. Woodley is also home to the recently transformed snooker palace, which following the removal of its snooker tables has become the Palace Bar, now closed and up for sale. Woodley is the home of semi-professional football club Stockport Town. They are currently members of the North West Counties League Division One South, the tenth tier of English football, and play at Stockport Sports Village. ^ Ian Templeman. "www.nwcfl.com - News - Stockport Town Admitted To The NWCFL". nwcfl.com. Retrieved 15 November 2015. 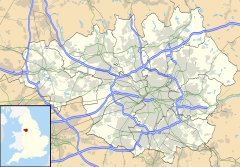 Wikimedia Commons has media related to Woodley, Greater Manchester. This page was last edited on 7 November 2018, at 08:50 (UTC).